ICP-MS is the most powerful technique for accurate and reliable multi-elemental analyses at trace levels, in gaseous, liquid and solid samples. Its applications range from the semiconductor industry to geological and environmental analyses, from biological research to material sciences. One of the major challenges in ICP are the polyatomic interferences on the elemental signals, originating from Ar and/or the sample matrix. In order to identify and eliminate interferences, high resolution is the gold standard. Elimination of interferences enables accurate and reliable quantitative multi-element analyses at trace levels, even without sample preparation. Our ICP-MS instruments combine this key feature, together with high sensitivity and high dynamic range. The detector system combines a dual mode SEM with a Faraday detector enabling a dynamic range up to 1012 cps. 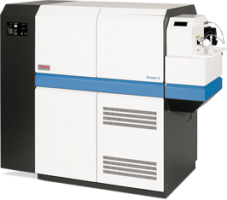 Our HR ICP-MS instruments can easily be coupled to external sample preparation systems and peripherals, like Gas Chromatography, HPLC and Laser Ablation.